Over this weekend (March 7th – 9th, 2014), Indian Institute of Management (IIM) Udaipur’s Entrepreneurship Cell “Saksham” organized a 32 hour startup challenge event. The event which was first of its kind in Udaipur was a huge success drawing in over 40 participants from all over the places. I had the privilege and honor to be closely associated with the event from its inception and this blog post talks about that. Premise of this event was simple. Potential entrepreneurs would pitch in their idea (they would get about 90 seconds for that) and then the idea gets voted by the participants. Ideas with most votes would go to the next round where they have to build an MAP (Minimum Awesome Product) in next 32 hours. I was told that originally about 10 – 15 folks signed up as “man with a plan” but when these guys started pitching their ideas, it excited other folks and in the end a lot of folks presented their ideas. It fostered team-building: It really takes courage and lot of effort to work with somebody you just met. It fostered flexibility and openness: As I mentioned above, not all ideas got selected. So the guys whose idea didn’t get selected didn’t go away; instead they became a part of other team and made the vision of the selected team their own vision. Kudos to the guys for this. Once the teams were formed, there were mentors who would guide them. The role of the mentors was to critically analyze their offering and provide guidance and advise throughout the process. There were six team which made it to the second round. This idea catered to High-end Big Fat Indian Weddings. The idea is to create a mobile app which will cater to the guests attending the wedding. It would allow guests to RSVP, get notifications about various events happening with the wedding, share pictures etc.etc. 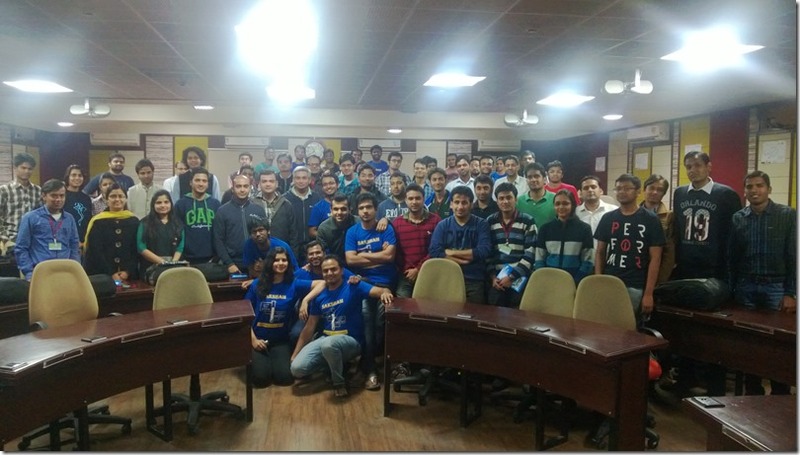 Here’s an interesting back story about this idea: Last month we organized a cloud camp in Udaipur and we invited my good friend Dhananjay Kumar to speak at this event. Piyush Javeria (leader of the WedWay team and organizer of cloud camp event) and I went to pick Dhananjay from the airport and on our way back Dhananjay started talking about the wedding of prince of Udaipur which concluded a few days back and that discussion was the inception of this idea. The key takeaway for me from this idea is that ideas can come from anywhere. You just have to be receptive about the ideas. This idea catered to marketers and content creators and is about providing insights into what’s trending on social networks (Facebook, Twitter etc.) related to someone’s business and identify the folks who are influencers. Here’s an interesting back story about this idea: Dinesh Agarwal (leader of this team) is a good friend of mine and he had no idea about this event. We were having a casual conversation early last weekend and I mentioned about this event and he jumped on that and decided to attend. He had to make travel arrangements at a short notice but he did that. The key takeaway for me from this is that you have to be flexible. I invited a lot of folks from my city and they didn’t show up citing some excuses (some of them were genuine BTW :)). Simply put, Find Guru is a market place for individual teachers specializing in cultural arts and connecting them with art learners (hobbyists). So if you as an individual want to learn say guitar, this website will connect you to teachers in your area or nearby areas who would teach you. Here’s an interesting back story about this idea: This was one team with most developers I think. Some of them were PHP developers while some were .Net developers who have never worked with PHP. .Net developers started learning PHP but then found it counter-productive as they only had 32 hours to come up with the product. So in the end they had 2 websites (not integrated because of time constraints) which served their purpose. The key takeaway for me is that you have to be flexible and take one for the team (.Net developers trying to learn PHP). Another one which I always say is that “Let the technology work for you and not the other way around”. All technologies are more-or-less equally capable and you just have to find which one serve your purpose. Don’t get hung up on technology. As a parent, this idea is very close to my heart. If we look at us as typical Indian parents, we would want our kids to pick up a profession we think would be best for them and are socially acceptable (engineers, doctors etc.) without thinking about what the kids want and what they are good at. Anhad tried to solve the problem by identifying the kid’s potential and guiding them various career options through either psychometric tests, one-on-one counseling or putting them in touch with experts directly. Not to be sexist or discriminating but this was the only team where the leader was a girl. Very fitting for the International Women’s day! The key takeaway for me from this is that you “can” think outside the box. You don’t have to go with the flow and do what all others are doing. Simply put, Artify is “Art As A Service”. The idea is that you could rent artwork through their network for much cheaper and keep on rotating it. Their goal is to connect artists with art connoisseurs and businesses. It was both a Business-to-Consumer (B2C) and Business-to-Business (B2B). The key takeaway for me from this is that as an entrepreneur you just have trust your guts and stick to your convictions and not swayed by what people are saying. Owning up failure was another takeaway for me. As an entrepreneur, this team is closest to my heart. The idea which they started with is to connect information seekers and information providers (experts) in real-time using various collaboration technologies (like phone, chat, video conference etc.). To put it mildly, they get their asses kicked. They pivoted, and again get their asses kicked! They pivoted again and again and again :). I was simply amazed by the team’s resilience and the willingness to pivot. I was deeply touched and greatly inspired by their “never-give-up” attitude. There were many takeaways for me from this team – resilience, flexibility, openness, and never-give-up attitude to name a few. There were eight mentors for this event and I feel honored and privileged to be a part of that group. As mentors, our job was to bring the best out of the teams by any means possible. We encouraged them, applauded their efforts, criticized their ideas with the intent for them to be successful. I personally learnt a lot from these mentors just by observing them and trying to understand their thought process when they interacted with the teams. Mentors included Mukund Mohan, Pranay Gupta, Anuj Pulstya, Gaurav Sharma, Dilnawaz Khan, Chintan Bakshi, and Nilesh Trivedi. This event was organized by IIM Udaipur’s Entrepreneurship Cell “Saksham”. It was their first attempt at organizing an event of this type and scale and I must say I was truly impressed! The event was meticulously planned to the last details and flawlessly executed. Kudos to the entire Saksham team for making this happen. I would specially like to call out Rishiraj Kashyap, Vaibhav Arora, Chandan Kumar, Riya Aggarwal, Aditya Raghunath, Aditya Rajadyax, Neha Singh, Kunal Gulati, Arun Pandidurai, Kamlesh Raghnani, and Sunil Kumar for a job very-very well done. Keep it up guys! The event started in the evening of March 7th and concluded on March 9th. On this day, the participants poured in from all over the country and made IIM Udaipur their home for next 2 days. The event started in the evening by presenting the ideas. After the ideas were presented, participants voted on the ideas and selected 6 ideas. Once ideas were shortlisted, teams were formed. The day ended with teams bonding with each other by getting to know them better. This is the day when clock started ticking! The teams started to brainstorm the idea and working on the MAP. A little later mentors came in and started interacting with the team and teams got to taste the realities of life :). The teams continued to work through out the day and night (one team in particular pulled an all nighter). The teams had until 5:00 PM on the 3rd day to come up with the MAP. I could feel the tension and anxiety in the atmosphere as teams continued to build the applications, revising their pitch and what not. At sharp 5:00 PM, the competition ended. A little while after that the teams were asked to make a presentation and give a demonstration of the application they had built which followed by really great questions from judges. Judges chosen for this event are all industry veterans and represented largely by folks from angel network/VC communities. Based on the presentations and Q&A sessions, judges then declared the result. WedWay won the 1st prize and BuzzCaptor was runners up! All in all I think the event was extremely successful. Personally it was a great learning experience for me. Plus I made a lot of new friends. I sincerely hope events like this happen more often in my town (and I get to attend these events).